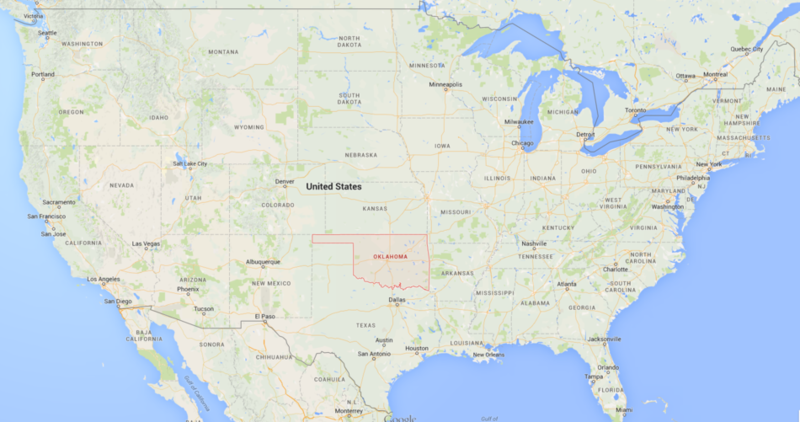 Earthquake in Oklahoma - the result of the continental rifting of North American Plate. A significant increase of seismic activity in Oklahoma (United States) from 2014 –H1 2015 raises serious concerns among climatologists. The frequency and magnitude of tremors becomes stronger every day. What is the true cause of activation of seismic phenomena in this region of the planet? According to the established tectonic maps, this area is located in the heart of the North American Plate and on all laws, such phenomena should not occur here. However, they occur even with a greater intensity. Fig. 1. 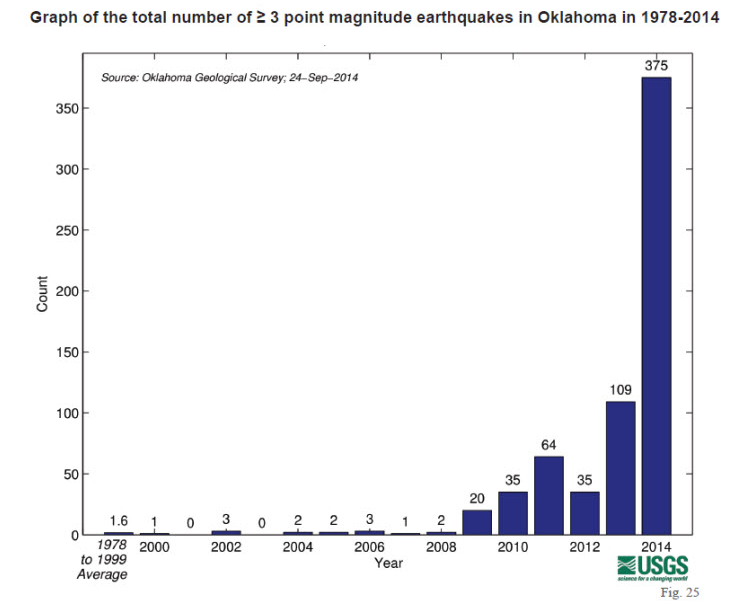 Total number of earthquakes in Oklahoma from 1978 to 2014 of magnitude >= 3.0 (USGS). According to statistics, from 1978 to 2008 only 1-2 magnitude earthquake in the year of 3.0 or higher was recorded in Oklahoma. Since 2009, their frequency has increased significantly (see Fig. 1). Today, Oklahoma became the most earthquake-prone US state, after California. We can see significant growth of seismic activity in this region in just two years – 2014-2015 on Fig. 2. With the frequency of earthquakes, their magnitude increases too. If three years ago, the normal strength of tremors for the residents of Oklahoma was the magnitude of 2-3 points, in the first half of 2015 there are tremors of magnitude of 3.5 - 4.2. If this growth trend continues, it is easy to guess what difficulties expect people in the nearest future. Due to official sources, seismic activity in Oklahoma is a result of shale gas production by hydraulic fracturing method – fracking, at which the different liquids and gels are injected into a well. But this assumption is wrong, and all the studies which explain this point of view do not have, at best, a real tectonic pattern. In June 2015, within one day the highest-rated American scientific journals published two articles containing justifications of this hypothesis [1, 2]. Those, who face with the principles of the majority of media, understand how it works. When it is necessary to popularize a particular point of view in society, at the same time in different publications, appear works from different authors and different scientific institutes giving the necessary "scientific" justification. Articles build only a mathematical model of the link between growth of shale gas production and seismic activity in the region. It is well known, that it is possible to build any mathematical model with the known output parameters. It does not matter, as people understand nothing. But will such model reflect the real tectonic situation? Hardly… There is no link between shale gas production and seismic activity in Oklahoma City. In November 2014 an international group of scientists of the International Public Movement «ALLATRA» was presented scientific report «On the Problems and Consequences of Global Climate Change on Earth. Effective Ways to Solve These Problems» . It describes a true reason of seismic activity increasing throughout North America. The increased number of earthquakes in Oklahoma related to the formation of the continental rift of North American Plate. There is a similar tectonic pattern in other areas, adjacent to the future fracture zone (see Fig. 3). Fig. 3. 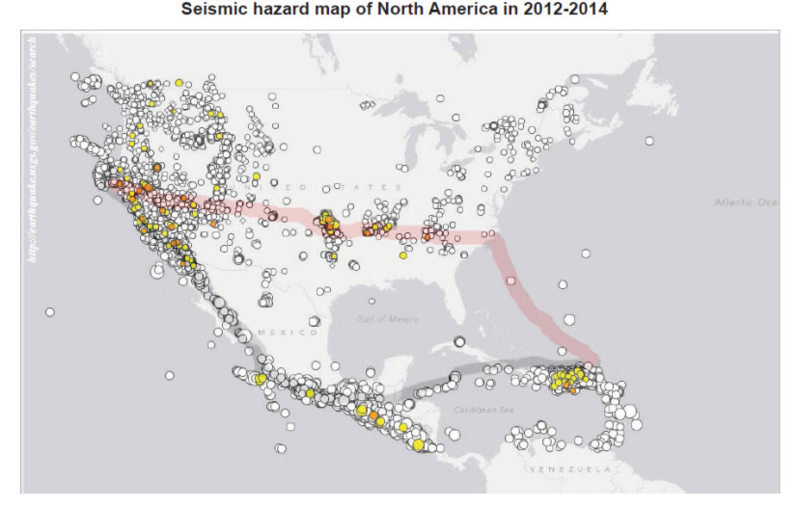 A map of seismic activity in North America for 2012-2014. Red line indicates the formation of the fracture on the continental crust of North American Plate. It is not the only problem for North America, as there is the largest active super volcano - Yellowstone. Moreover, according to the latest data, it wakes up. More about this you can read in the article: «Seismic processes around Yellowstone supervolcano. The eruption is inevitable!» . What steps people need to take to minimize the effects of these tectonic and volcanic processes, which unfortunately are inevitable? relocation of people from dangerous territories. Only if we unite on creative foundations, humanity will be capable, thanks to the development of ALLATRA SCIENCE, to solve global climate challenges of today! Seismic processes around Yellowstone supervolcano. The eruption is inevitable!